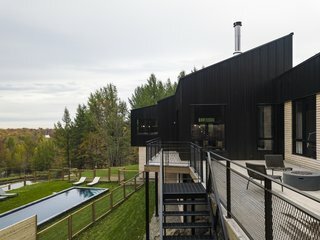 Surrounded by valleys and dense foliage, Abercorn Chalet is a bold, stylish retreat that embraces the natural wonders of Quebec’s Eastern Townships. 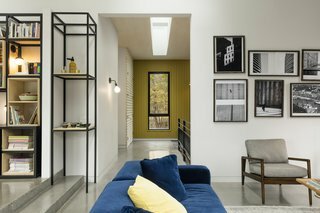 Designer Laurent Guez, partner at Tux Creative, collaborated with architect Guillaume Kukucka to create a simple but powerful residence with hints of playfulness incorporated throughout. 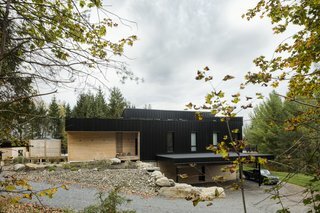 The modest cottage much resembles a barn or campground in its industrial materials, connection to the outdoors, and series of outbuildings. The grand property includes forested land, a reflecting pond, and a private pool—all of which can be enjoyed from the picturesque living spaces. 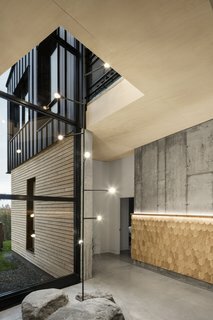 The retreat is a composition of light and dark, wood and metal. These materials wrap the masses as they hover above the landscape. The backyard features an in-ground pool and a garage/workshop. The building's facade strikes contrast between dark and light as corrugated metal and wood interconnect through the various stepped masses. Four volumes create an open floor plan that celebrates the surrounding landscape. 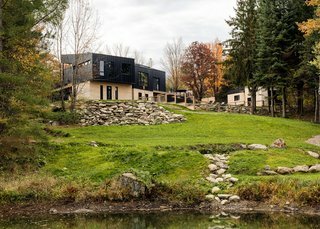 The home extends slightly outdoors, reaching out to the surrounding landscape and providing views and spaces for enjoying the natural wonders of the site. Large openings create the feeling of being outdoors, while remaining protected inside. On the interior, opposites attract through contrasting open spaces and quiet areas. Daylight and views are emphasized through large windows and openings in the ceiling above. Unique angles encourage occupants to embrace views of the garden, patio, and valley. Simple lighting, wood-shingled walls, and modern furnishings create a stylish lounge space. 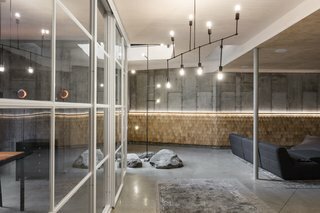 The two-story, light-filled courtyard opens the ground floor up to the floors above, providing visually transparency between floors. Built-in bar seating looks out upon the surrounding trees and into adjacent living spaces. This industrial-style kitchen with stainless steel counter tops is a chef's dream. 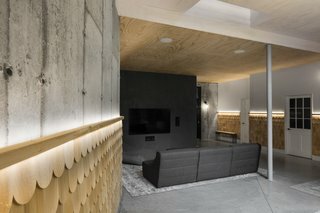 Playfulness in space separation and materials add extra boldness to this modern retreat. 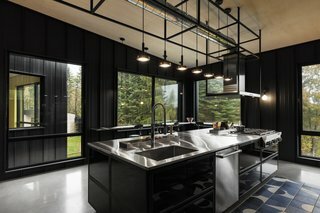 Rich colors blend with natural and industrial materials, while unique interventions add unexpected surprises to the simple, architectural chalet. 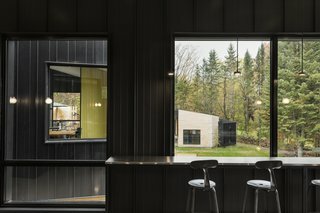 Yellow corrugated metal walls with grand glazed openings provide a bold space for dining in the trees. Rich pops of color accent the mostly neutral finish palette. 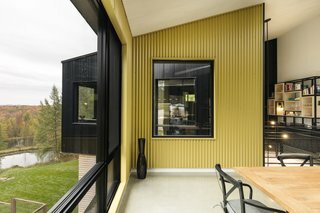 The corrugated metal walls carry inside at special moments, such as in the master bedroom. 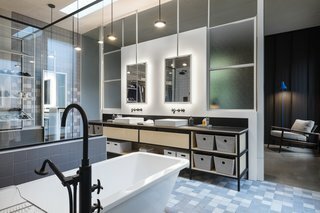 Re-thinking the typical separation of spaces, the master bath is open to the master bedroom, separated by a partition wall and textured glazing. Contemporary closet solutions flank the other side. 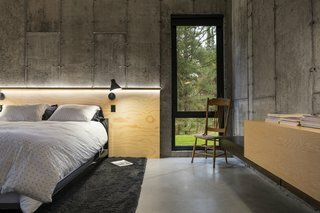 Concrete walls, a plywood ceiling, and built-in wood furnishings create sleek, minimal sleeping quarters. 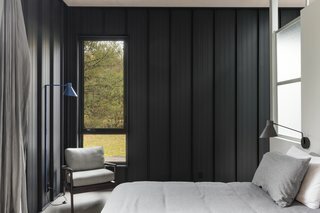 A plywood headboard is adorned with modern black sconces. 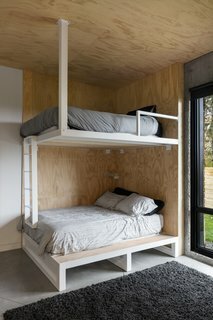 Built-in bunk beds embody the playfulness of camping. 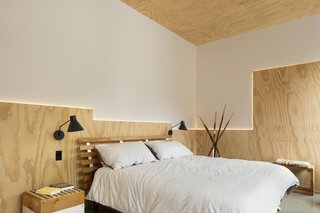 A geometric arrangement of back-lit plywood adds flair to a simple bedroom. 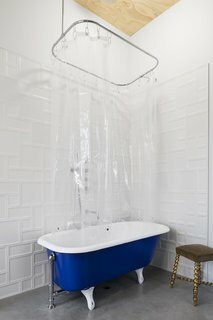 An eclectic mix of patterned tile and a re-finished, brightly painted claw-foot tub create a playful, modern bath. A cozy lounge space is wrapped with wood-shingled walls.